Items from this early American collection date from Paleo-Indian period of about 10 thousand years ago to the late historic and historic periods of 300 years ago. 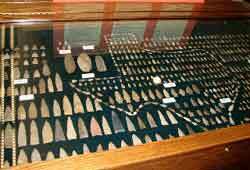 Items range from projectile point fragments which were part of weapons used to hunt larger animals such as Ice Age mammoths and bison. Other items include pottery from the late-historic period. This display is truly a lesson in history. Located at the Giddings Public Library and Cultural Center at 276 N. Orange Street. Completed in 1899, this courthouse replaced the original from 1878 which was lost to fire. The architecture is Richardsonian Romanesque. It is said to be octagonal in shape with the four sides facing the four points of the compass. The Courthouse is at 200 S. Main Street. Open to the public during business hours 8am-5pm. This museum in downtown Giddings houses the Lee County Heritage Center and tells the story of Lee County from Native Americans to present day. Videos, memorabilia, maps and photos. Check out the Historical Markers of Lee County! There are about 40 of them throughout the County, 20 located within the City of Giddings. Our PDF booklet lists all the markers and their location. Historical Marker Book. This carousel was manufactured in the 1900's and part of a traveling carnival. It was left in Giddings as collateral on a debt. Restored, it is now exclusively enjoyed during the Lee County Fair in May (3rd weekend) and the 4th of July Celebration. The First Presbyterian Church of Giddings, Texas was organized on April 28, 1876 with thirteen charter members under the direction of B.H. Behers, D.D. One of the charter members, Frank Morris, was responsible for constructing the present sanctuary in 1886. The Sanctuary has been in continuous use since that time, making it the oldest church building in continuous use in Giddings. Location: 192 South Grimes. Open for Sunday Services at 9:30am. A marking of the final resting place of gunslinger, Bill Longley of Giddings. After being hung three times, he finally was laid to rest (verified by the Smithsonian). Graveyard is just outside Giddings, going west on Hwy 290. Somerville, Lake Bastrop, Bastrop State Bank and Buescher State Park. The Birds of Lake Somerville. Home to the Lee County Little League, city swimming pool and tennis courts. Located one block off Hwy 290 at the intersection of North Montgomery Street. Home of the Hilton Lee Smith Field, Lee County Soccer fields, covered basketball courts and picnic pavilion. Located at 800 W. Independence. Camping, fishing, hiking and boating available. "Cowboys Receiving the Mail" by Otis Dozier (1939) painting which is part of 109 works of art painted during the Great Depression for display in Texas post offices & federal buildings, is located in the Giddings Post Office at 279 E Austin Street. It is a piece of living history, a reminder of President Franklin D. Roosevelt's efforts to give work to artists during that time of poverty. Post office is open to the public Mon-Fri from 8am-4pm. Local Business Mural – It’s not historic but it will be. Painted by local artist, Johnny Jones, this mural turned a mundane brick wall into an interactive attraction. The scene depicts several local businesses and townsfolk but cleverly hidden in the mural are 12 items: a mouse, fishing hook, chameleon, penny, clothespin, dime, nail, safety pin, butterfly, eye glasses, cat’s eye marble and a thimble. Visitors are invited to try and find them all. Located in the Post Office parking lot at 279 E Austin Street. Hilton Lee Smith is a Hometown Hero, born in Giddings Texas. He became one of the greatest baseball players. He moved to Kansas City to join the Kansas City Monarchs and played alongside pitcher Satchel Paige. Hilton Lee Smith was inducted into the Baseball Hall of Fame in 2001. This collection of memorabilia is housed at the Giddings Public Library & Cultural Center at 276 N. Orange Street. The Library is open to the public Mon-Fri 10am-6pm and Saturday 10am-1pm. Call the Library 979-542-2716 for more information. The Texas Wendish Heritage Museum preserves the history of the Texas Wends, Slavic immigrants from Lusatia, an area in eastern Germany. The Museum is located in historic Serbin, 7 miles outside of Giddings at 1011 County Road 212. The St. Paul Lutheran Church, school and cemetery are right next door. The present Church building, built in 1871, is one of the painted churches of South Central Texas. The Museum and Library are open Tuesday thru Sunday 1:00 to 5:00 p.m., and are closed on Mondays and holidays. Admission to the Museum for non-members is $2.00 for adults; admission for children 14 and under is free. See the video documentary video below which includes information about the Wends.